DYNAMOS Football Club on Friday held a crisis meeting in the presence of Zifa president Philip Chiyangwa, as part of efforts to stem growing tensions between executive. DeMbare board chair Bernard Marriot introduced new club president Solomon Sanyamandwe to Chiyangwa, and the ensuing meeting resolved to reinstate Treasurer Moses Chikwariro and secretary Webster Marechera, who were fired a fortnight ago. Sanyamandwe yesterday sounded confident everything was now moving “in the right direction” ahead of this afternoon’s Castle Lager Premier Soccer League game against Harare City at Rufaro. The Dynamos boardroom has been a war zone in recent weeks, with Marechera and Chikwariro being booted out for alleged misappropriation of funds. Sanyamandwe, who has been striving to instil corporate governance at the volatile club where allegations of embezzlement are rife, wielded the axe on Marechera and Chikwariro before DeMbare’s trip to Highlanders. Chikwariro, who The Sunday Mail Sport understands is not a favorite amongst the players, defied the dismissal and travelled to Bulawayo for the game against Highlanders last Sunday. He also conducted his normal duties during the midweek fixture against Chapungu, with sources claiming the fights were having a snowball effect on the club’s performance on the pitch. DeMbare followed up their 0-3 drubbing at Highlanders with a lifeless 0-0 draw against Chapungu at Rufaro on Thursday — a result that left them in relegation danger as the season heads to the wire. Sanyamandwe confirmed the Friday meeting and assured DeMbare fans all was now well at a club renowned for endless boardroom squabbles. “We had a meeting on Friday and all the pressing issues were ironed out. Everything is now moving in the right direction; each and every executive member was given full reins of their respective portfolios,” said Sanyamandwe. When The Sunday Mail Sport sought a comment from Chiyangwa, the flamboyant football leader said: “Talk to (Dynamos board chair) Marriot; he just came to introduce the new Dynamos president.” Marriot was not reachable on his mobile phone. Focus now shifts to the field of play where a below par DeMbare date Harare City this afternoon. Dynamos lost the reverse 1-2 and coach Lloyd Mutasa was subsequently relieved of his duties before bouncing back a few weeks later. 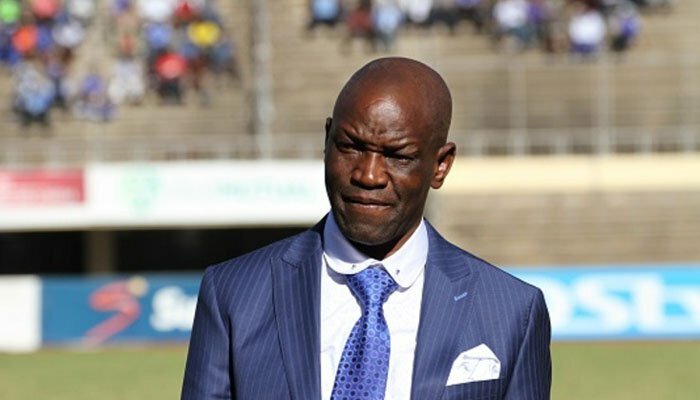 Mutasa’s continued stay at the helm depends on how his charges perform between now and the end of the season. The Chibuku Super Cup could also offer a lifeline. “What we said we would achieve in the second half of the season is far from what we are doing right now. We are not moving in the right direction, we need to turn things around,” Mutasa told The Sunday Mail Sport after draw with Chapungu. Dynamos are on 30 points, just three above the relegation zone, and will find themselves in deeper trouble if they lose to Harare City this afternoon. DeMbare will be without suspended Peace Makaha, who would have missed the game anyway through an injury sustained midweek.